to your nails for an amazing look. your clothes and to last longer. gold that has gold powder or gold flakes embedded in acrylic. lacquer for use with the stones. Place a layer of enamel, then carefully place the stones where you want and press them. When drying the enamel adds another layer of gold flakes to finish. manicure decorated. Its best use gold leaf foil for a more natural look. rely on the services of manicurists. artistry, making other decoration which requires the skill of a manicurist. 23k gold. Salon and spa can upsell easily. 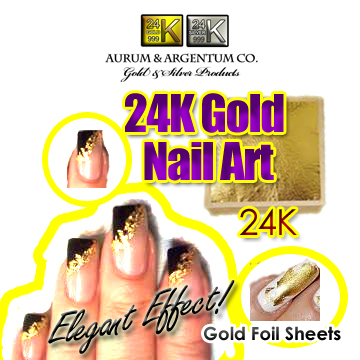 Offer a new product to your customers with 24k gold foil for nails or pedicure. When thinking of your next arts and craft project how about adding gold leaf foil to the mix. Add more value to your DIY project. Scrapbooking is a hobby for many people but for others its a passion. Make your scrapbook standout with gold leaf foil. 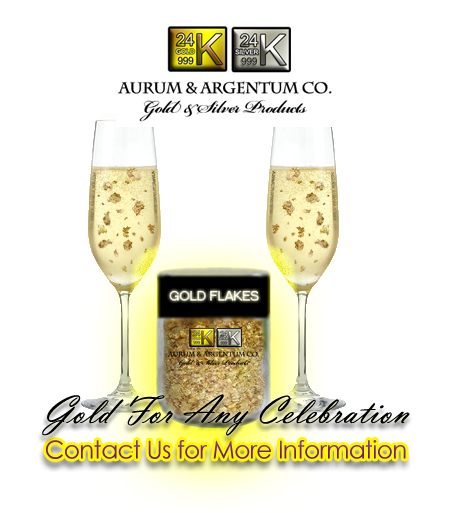 Aurum & Argentum Co has products that will enhance your creative design. By adding gold to your craft or art, you are also increasing the value of your product if you plan on selling it. Artists add gold leaf foil to their paintings. Wood carvers use it as a detailing feature. Sign makers have been using gold leaf foil for years to make elegant signs for storefronts. The latest trend has been putting gold leaf foil on vehicles for advertising. DIY earring makers wrap earring in gold to make a more vibrant and luxurious look. If your making pottery lining it with gold leaf foil will bring it to showpiece status. 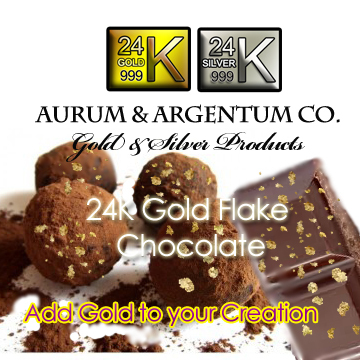 Aurum & Argentum Co gives examples of what gold can be used for, so get started on your project right now. We offer gold products at wholesale prices. And we are always looking for distributors. We will be getting a distributor package ready for those interested in selling gold products. You could even have your own brand. Here are some other products that could be made with Aurum & Argentum Co gold leaf foil. 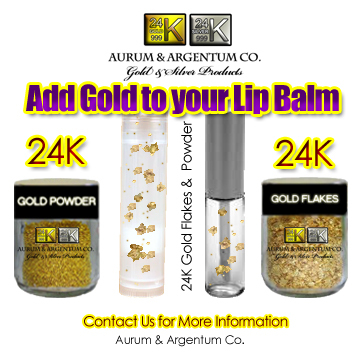 Buy Lip Balm Stick with 24k Gold Flakes or Powder in it. Where to buy lip balm stick with gold flakes or gold powder for cosmetics? 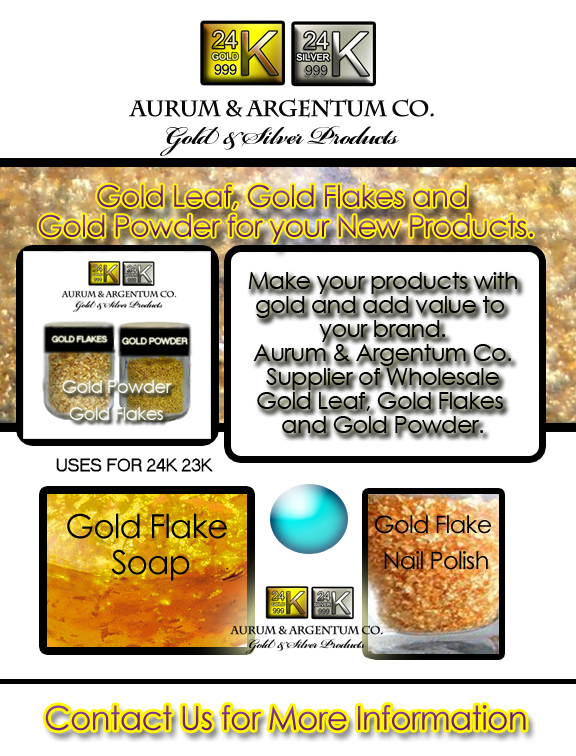 Note: Aurum and Argentum Company sells gold flakes, gold powder and gold leaf sheets for your DIY project or new product line. A lip balm is a skin care product for application to the skin of the lips. It serves to protect the skin from external influences (eg UV light, etc.) and dehydration or treating dry, rough lips. In contrast, when it comes to lipstick or lip gloss cosmetic properties, both are connected to each other to some extent. Normally, the product consists of waxes, fats and nourishing cosmetics or other additives like gold powder or flakes. From the mixture, a solid stick is usually formed. There are also liquid, creamy products, which are referred to as lip balm. These are usually made ​​in the form of a tube and can be applied directly from this on the lips. Gold leaf is the name for a high-gold alloys made ​​from thin sheets. It is used for non-metallic articles to give the appearance of real gold (gold plating). The thickness of the gold foil meets today about one fifth of the wavelength of visible light, ie about 0.1 microns or 100 nanometers, it can differ depending on the application. So for plastic surfaces rather thinner blades are used. In reflected light shines golden yellow gold leaf, backlit by a white light source appears greenish blue. Gold leaf is made ​​from the so-called gold-beating with a hammer spring. Gold leaf can be made thin in thicknesses of 100 to 1000 atomic layers. A gram of gold is in the normal thickness of 100 nanometers, an area of ​​about half a square meter. In Roman times the thickness was about three micrometers, in the 14th Century one micrometer. The gold is combined with additives (platinum, silver, copper) is melted and poured into bars. 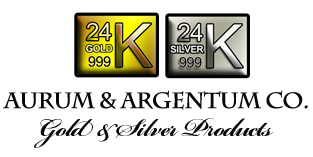 Our Aurum and Argentum Company gold is combined with silver. The additives are responsible for the desired color of the gold leaf. The bars are then rolled into a gold band about the strength of newsprint and cut into squares (quarters). 400 to 500 of these quarters are placed one above the other in a crusher and more passes repeatedly beaten and cut up the large districts about 8 by 8 inches and a ten-thousandth of a millimeter thick. Gold leaf is used mainly for gilding picture frames, books (gilt) used furniture, figures, architectural elements, stucco, icons, etc.. Gold leaf is it – depending on the purpose and desired effect – applied with special adhesives and often polished. In Buddhism, gold leaf sheets are used for rituals. The consumption of gold is safe and exemplified in Danziger Goldwasser, Schwabacher Goldwasser or flavored wine-based drinks (for example: Gold Blend liqueur with gold or gold of Austria Inführ champagne) drinkable. 22k 23k 24k carat gold leaf sheet are used as a food color E 175. 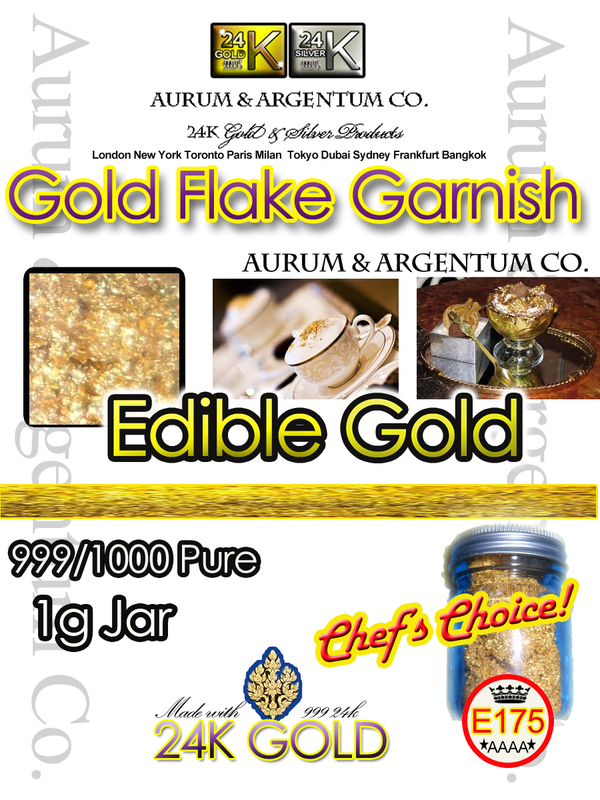 Gold leaf is also used for gold garnish of food and drinks, pastries and gourmet food. A coming trend is using gold leaf sheets, gold powder and gold flakes as a makeup and cosmetics additive for special effects. 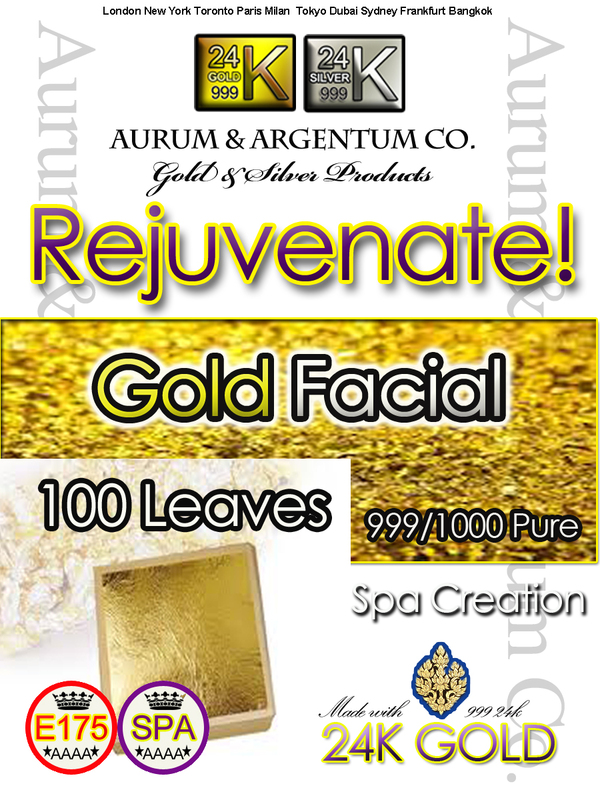 Cleopatra Gold facials sheets have become popular in mainstream culture and spa as a sign of wealth. Salons are adding gold leaf to nail polish and hair for glamorous look. Henna gold leaf or gold in hair is popular with newly weds. Gold Leaf sheets foil 24k for scrapbooking, art, crafts, gilding statues and home decorations. 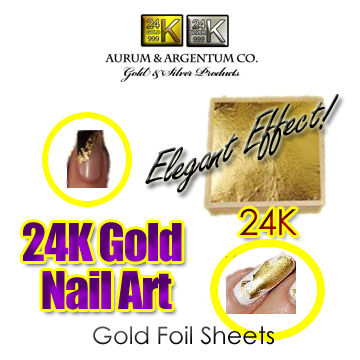 Aurum and Argentum Co has gold sheets for your creative art projects. Add glimmering features to your scrapbook or make a statue come to life with gold. Many artists like to gild their statues with gold leaf sheets to add more value. There are many resources on how to apply gold leaf foil to your project. Make an elegant master piece and display it with enhanced features with a touch of gold. 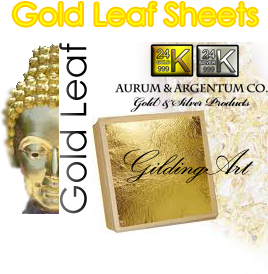 See our wholesale gold leaf sheets product list here. 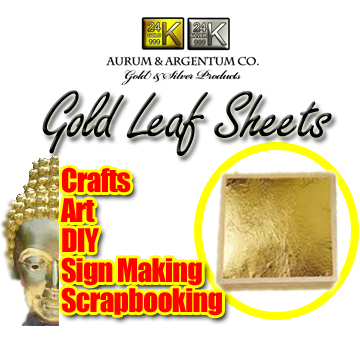 So get started and show off your scrapbook or statue with gold leaf sheets. Chocolates are a favorite among all people. Why not add gold flakes as a chocolate garnish to add elegance to your chocolate products? 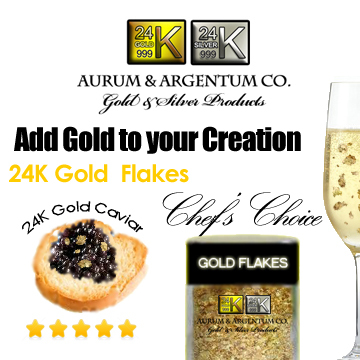 Aurum and Argentum Company makes that possible with our 24k gold flakes. Impress your patrons and add value to your creation, it’s a great up sell and a showcase piece. It is a conversation topic to promote your brand. Gold flakes topping also has eye appeal with its attractive sparkling features. Let customers know you really has a quality product that stands out. 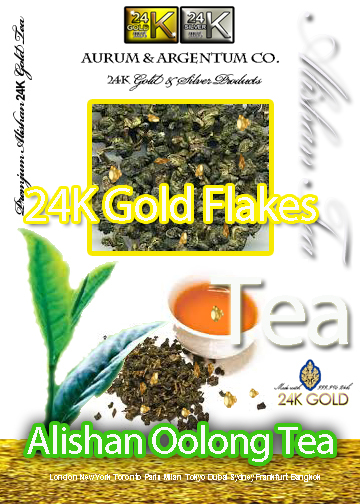 We have 3 products gold flakes, gold powder and gold leaf sheets foil. See our products here. Wedding food decorations with gold flakes are popular this day and age. Guests will remember your 24k gold chocolate gifts for years to come, so make it memorable. See our other products and ideas for gold flakes. Another idea is to add gold flakes to the main course of your wedding dinner. Wow your guests with a gourmet topping. Or even put gold flakes on dessert. 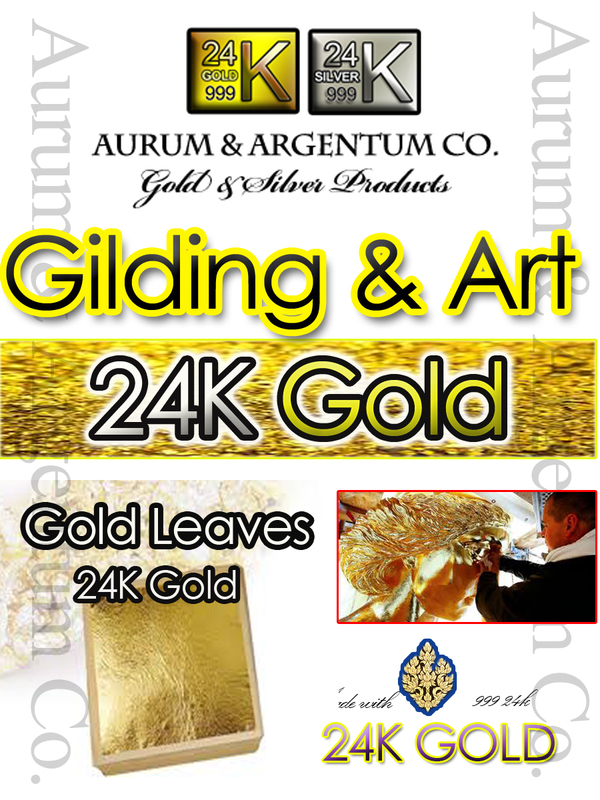 Please note Aurum and Argentum Company is a wholesale supplier of gold products. We don’t sell champagne.